Under the new tax law, business owners are entitled to deduct 20% of "qualified business income." The test for qualifying for a tax break on 20% of business income is defined in the Tax Cuts and Jobs Act (TCJA) and summarized here along with a simple illustration. If you formed your BUSINESS as a sole proprietorship, S corporation, partnership, LLC or similar pass-through entity, you are entitled to the deduction. C corporations don't qualify for the 20% deduction. Only businesses generating income not taxed at the company level, but directly to the owner. Qualified business income is the business' day-to-day, non-investment income. It's revenue the business generates minus expenses. QBI doesn't include interest, dividend income or capital gains on a property sale. Nor does QBI include salary or wages paid either as W-2 wages from an S corporation or guaranteed payments from a partnership. 50% of the total W-2 wages paid by the business. A separate limit based on the unadjusted basis of certain business assets could also apply, a rare situation. More important: The 50% W-2 wage cap kicks in when a couple filing jointly has a total taxable income of more than $315,000 ($157,500 for singles). Here's an illustration of a couple who owns a business with $200,000 in qualified business income, with no real assets, such as vehicles or real estate, and with one employee who was paid $50,000 in 2018. The couple would be entitled to QBI deduction of $40,000. That's 20% of $200,000. Because the couple's taxable income is less than $315,000, the wage limitation - 50% of wages paid to their employee - is equal to $25,000 and would not apply. 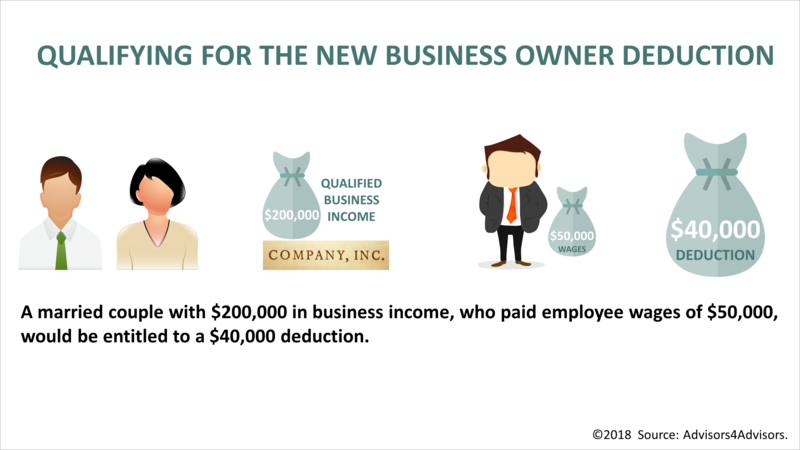 Some business owners with more than $315,000 in QBI may want to consider reducing their W-2 wages or guaranteed payments to qualify for the deduction, but this requires careful planning and personal consulting beyond this simple illustration. The rules are new and technical, and before changing how your business pays you to qualify for the 20% QBI deduction, it's prudent to contact us and plan properly. This article was written by a professional financial journalist for Parker Advisory Group and is not intended as legal or investment advice.